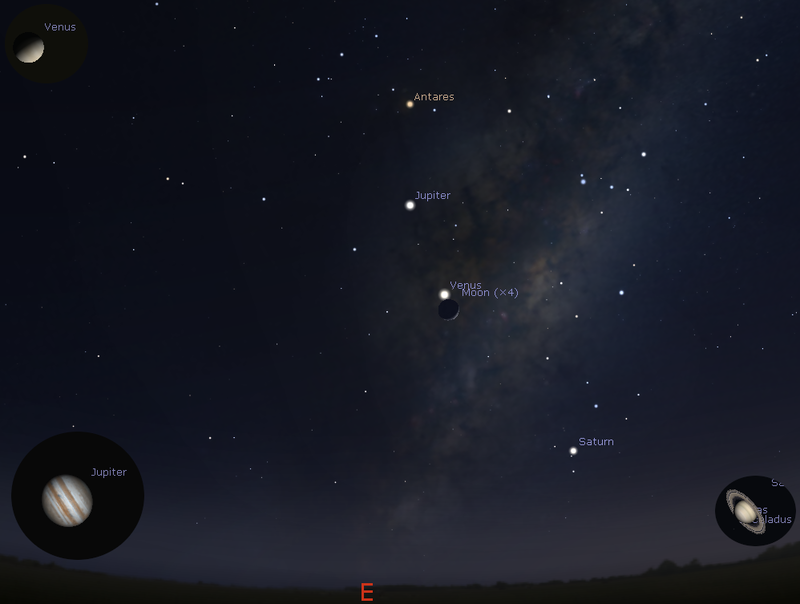 The New Moon is Tuesday, February 5. 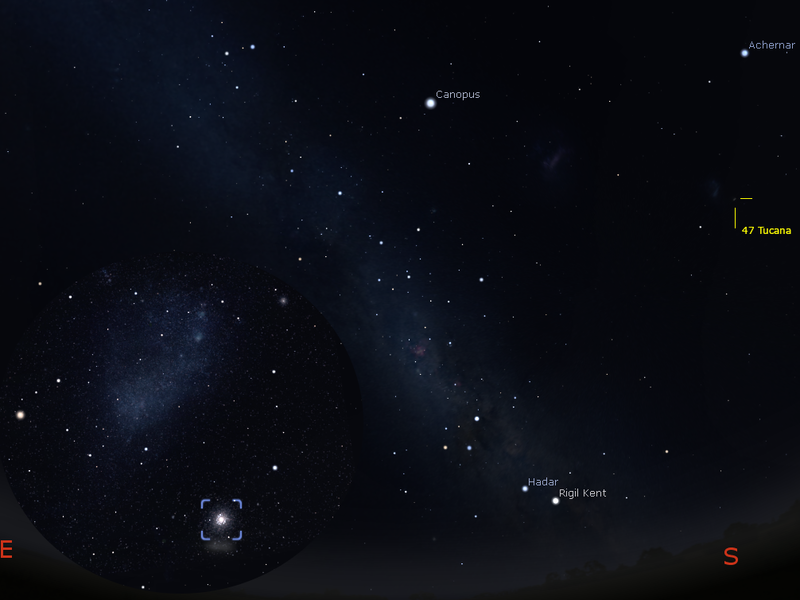 Mars is visible low in the evening skies. 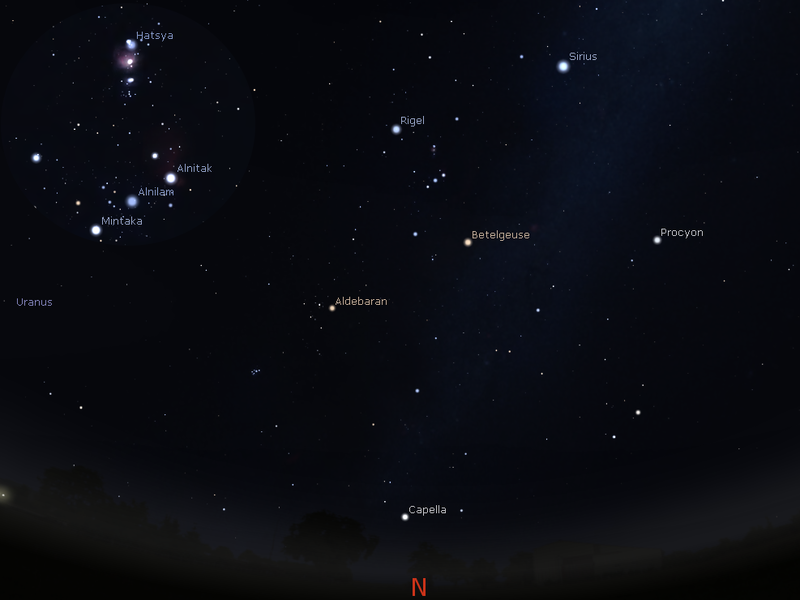 With the New Moon this is an excellent time to view the summer constellations. In the lead up to new Moon the morning skies are a glorious sight. Venus is bright in the morning sky with Jupiter above it and Saturn below. The crescent Moon is close to Jupiter on the 31st, Venus on the 1st and Saturn on the 2nd. The New Moon is Tuesday, February 5. The Moon is at apogee, when it is furthest from the Earth, on the 5th as well. Morning twilight sky on Friday, February 1 looking east as seen from Adelaide at 5:34 ACDST (60 minutes before sunrise). Venus is bright and is close to the crescent Moon. Jupiter is above Venus and Saturn below it. The left upper insert inset shows the telescopic view of Venus at this time. the lower left insert shows the telescopic view of Jupiter at the same scale and the lower right that of Saturn. The previous morning the crescent Moon was close to Jupiter, the following morning the crescent Moon will be close to Saturn. Evening sky on Saturday, February 2 as seen looking north-west from Adelaide at 21:56 ACDST (90 minutes after sunset). 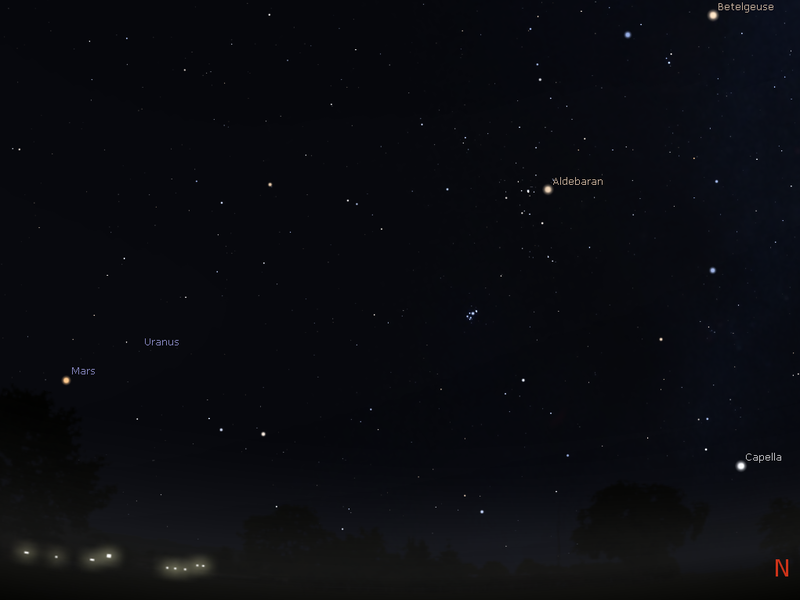 Mars is the brightest object above the western horizon.Uranus is visible in binoculars nut far away. Next week the pair will be close together. The Pleiades and Hyades also grace the north-western sky. Evening sky on Saturday, February 2 as seen looking South-east from Adelaide at 21:56 ACDST (90 minutes after sunset). This weekend is a perfect time to observe our wonderful southern sky. 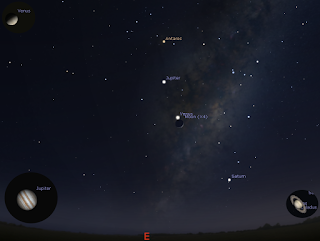 The Moon is a waning crescent that does not rise until morning twilight so this is an excellent time to look at the wonderful clusters and nebula of our southern skies with the unaided eye or binoculars. The Milky way stretches from the Southern cross (Wilto the Eagle to the people of the Adelaide Plains) in the south to the distinctive constellation of Orion and beyond. The Milky ways' satellite dwarf galaxies, the Magellanic clouds, (between and below the bright stars Canopus and Achernar) are easily seen away from the city lights. This is the last week to get a good look at these wonders before the Moon's light washes them out. The yellow lines bracket the globular cluster 47 Tucana, next to the Small Magellanic cloud under Achernar. The inset shows the approximate binocular view of 47 Tucana and the Small Magellanic cloud. Evening sky on Saturday, February 2 as seen looking north from Adelaide at 21:56 ACDST (90 minutes after sunset). The constellation of Orion dominates the northern sky, closer to the horizon, just to the west of Aldebaran and the A shape of the Hyades is the delightful Pleiades cluster. Venus is bright in the morning skies below Jupiter. Venus and the crescent Moon are close on the 1st. Venus is close to a number of interesting clusters, although you will have to wait until the 4th, when the Moon has moved out of the way, to see them at their best. Venus is initially within a binocular field of the open cluster M23, and by the end of the week is within a binocular field of the Trifid and Lagoon Nebula, although Venuses brightness may make them difficult to see. Jupiter climbs higher in the morning sky heading away from Venus. Jupiter and the crescent Moon are close on the 31st. 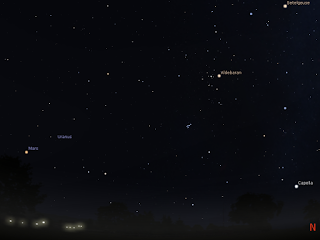 Mars is in Pisces and is readily seen as the brightest object in the western evening sky. Mars sets just before midnight. Mars is coming closer to Uranus and the pair will be close next week. Saturn is climbs higher in the morning sky. Saturn and the crescent Moon are close on the 2nd.